Anna Jane Cherry Enloe was born September 14, 1939, and passed away Thursday, August 31, 2017. Her health had been in decline for the past year, but we were shocked that such a vibrant life came to an end so suddenly. She was just shy of 78. Anna grew up in the small, east Texas town of Tatum. She was the youngest of four children to Gil and Janie Cherry. Considerably younger than her siblings, Anna was nicknamed Dinky (pronounced “Danky” in East Texas) and excelled at school and baton twirling, graduating as the valedictorian of her Tatum High School senior class. Anna went on to study at Stephen F. Austin University in Nacogdoches, Texas. 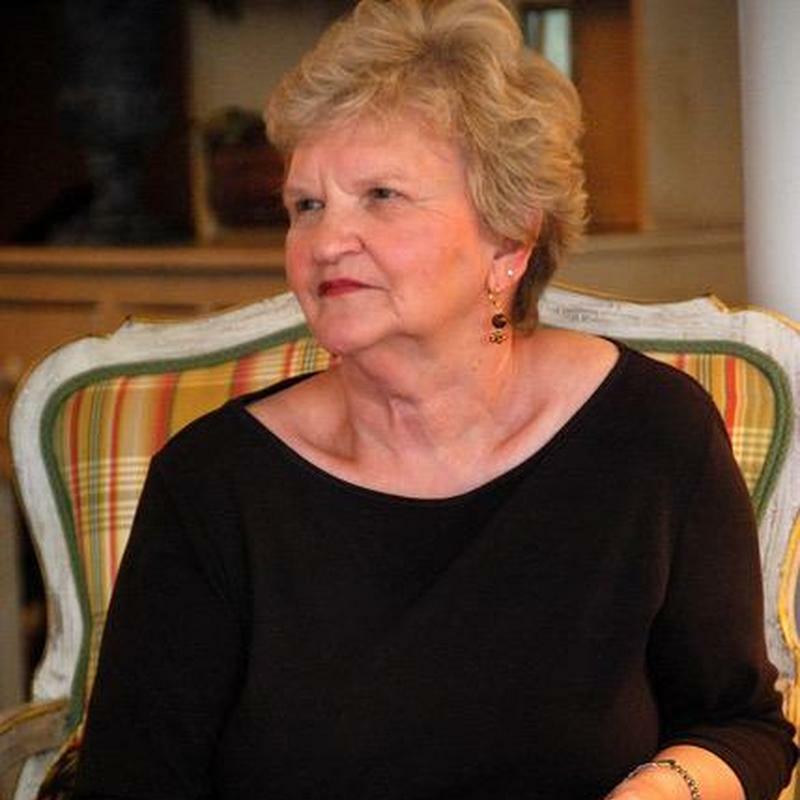 She was a proud member of what would become the Chi Omega sorority and, later in life, saw her daughter, daughter-in-law, and three granddaughters all initiated into Chi-O. Anna received her Bachelor of Arts degree from Stephen F. Austin and, subsequently, received a Master’s degree from Auburn University. Along the way, Anna fell in love with a lanky East Texan from Henderson named John Enloe, also a graduate of Stephen F. Austin. They were married, and John was commissioned into the United States Air Force. Together, John and Anna lived adventures far beyond the timber of East Texas. They lived in Turkey, England, and throughout the United States. Anna embraced life as an officer’s wife, planning functions, looking after enlisted families, and managing the home, despite multiple moves. Throughout their travels, Anna connected with other families and made life-long friends. She corresponded frequently, in several cases for decades; and their home was a welcomed site for visitors. A woman of faith, Anna was active in her church and, especially, CBS Bible Study. She encouraged her family to pray and develop their own relationships with God. Anna spoke her mind without being judgmental. Throughout her life, she suffered terrible migraine headaches without blaming a higher power. She modeled a life with Christ and inspired new mothers, friends, and her own family with her love and faithfulness. More than anything else, Anna will be known as Nana to her nine grandchildren. Anna Enloe was a FABULOUS grandmother. Each grandchild has fond memories of cuddling with her while reading stories for hours. She was always thrilled to hear the successes, adventures, and calamities of her grandchildren and reacted to each with just the right amount of humor, sympathy, and encouragement. Through college and beyond, grandkids came to visit Nana and Colonel, bringing friends from across the country to visit, hear a saucy comment, laugh hard, and aspire to #grandmothergoals. Anna is survived by a devoted, doting, loving husband, Colonel (retired) John D. Enloe, her sister Corrine Young of Tatum, Texas, her three children, David Enloe, Cherry Enloe Tapley, and Chris Enloe, and their families, including nine grandchildren. A memorial service will be held at Fairfax Memorial Funeral Home Thursday, September 7 at 1:00 with a reception to follow at Chantilly National Golf and Country Club. Anna will be buried at Arlington National Cemetery this fall. She was proud to enjoy the privilege of this final resting place. In lieu of flowers, the family requests donations to Nalani Horse Recovery (http://virginiahorseback.com/horse-rescue/). I cannot tell you how sad I was to find this. I knew Mrs. Enloe when we lived down the street in Montgomery, Alabama in the late 70's early 80's. She was a lovely person, and I have thought of her and her beautiful family often over the years. She was such a warm and gentle human being with a wonderful sense of humor and a huge heart. I remember her agreeing to adopt a stray dog I had found and agreeing to my childish pleas to keep the name "Muffin" that I had chosen for it. I cannot imagine many people acting with such kindness. My heart goes out to Colonel Enloe, David, Cherry and Chris, as well as the rest of the extended family. I was so sorry to find this today. I knew Mrs. Enloe when we lived on their street in Montgomery, Alabama in the late 1970's. I remember her and her family well and still think of them often. She was a lovely and kind woman with a quick sense of humor! I remember her adopting a stray dog I found, and even keeping the name "Muffin" I gave it. My heart goes out to her family and all those she touched during her beautiful life. Thank you to the well over 100 people who came to mom's service and to so many people online showing your love for her and support to us at this sad time. It was a lovely service, showcasing Anna's faith, love for family, and humor. We are dealing with the sudden loss of our mom and Nana as best we can, knowing that she is safely in God's hands, better than ever in Heaven. I so look forward to being with her again, laughing at something together. Blessings to you all. This is beautiful. She is well-loved and I'm sure you are all going to miss her. Thank you for sharing the details of her life, for those of us who didn't get the opportunity to get to know her. From the posts I've read, it sounds like she was an amazing grandmother and woman, full of love, and I look forward to the heavenly reunion one day!